It is widely accepted that hypoxia in tumours or myocardium with underdeveloped or obstructed vasculature, induces a switch from aerobic respiration to anaerobic glycolysis as the main fuel for ATP production. Tumours display a preference for glycolysis over oxidative metabolism even in the presence of oxygen. This observation was first described by Warburg and has since been recognized as one of the hallmarks of cancer. The expression and/or activity of glycolytic enzymes underlying this switch are controlled by several cell signalling pathways that results in upregulated glycolysis and lactate excretion and downregulated pyruvate entry into the TCA cycle. Developing inhibitors of these pathways is of enormous current interest for molecularly targeted cancer therapeutics and for developing clinically translatable molecular imaging approaches to report on these processes in vivo. Figure. 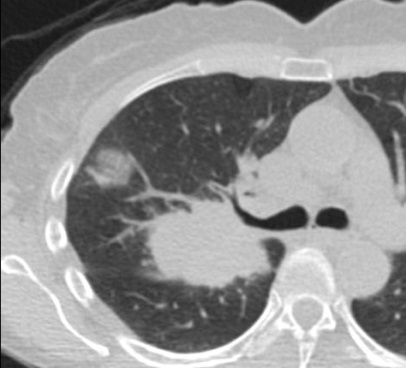 Clinical CT scan of a lung cancer patient (left) with a corresponding axial sections from an FDG scan (centre) and a 82Rb scan (right) (courtesy Groves UCLH). 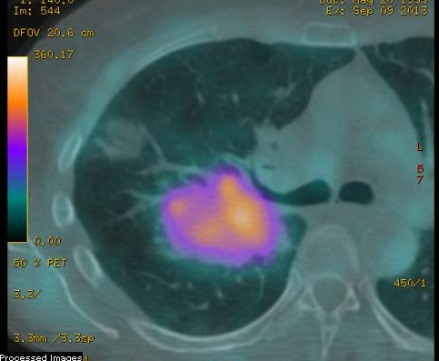 Tumours are highly avid for 82Rb as measured by PET. The aims of this CDT project will be to understand and validate the mechanism of its trapping and the relationship with tumour metabolism and treatment response to therapeutics. Na/K ATPase (EC 3.6.1.37) is the membrane transporter responsible for pumping 3Na out and 2K into the cell for every molecule of ATP converted, of which it is a major consumer. The ATP supply for Na/K ATPase has been suggested to be preferentially derived from glycolysis since it is spatially co-localised with the glycolytic enzymes pyruvate kinase, phosphoglycerate kinase and glyceraldehyde 3-phosphate dehydrogenase. Furthermore, in the human erythrocyte, which possess no mitochondria, previous work using 13C flux analysis of glucose consumption following treatment with the Na ionophore monensin showed that 6 ions of Na are pumped out of the cell per molecule of glucose consumed, suggesting a tight coupling between glycolytic flux and Na/K ATPase activity, while studies in a range of cancer cells have shown that activation of the Na/K pump with gramicidin (or inhibition with ouabain), leads to an increase (or decrease) in glycolysis, respectively. In this context there is evidence that Na/K ATPase could be a target for cancer therapy. Breast cancer patients receiving cardiac glycosides such as digoxin show distinct tumour cell morphologies, smaller tumour volumes at diagnosis, reduced metastasis after two years follow-up and showed reduced recurrence rate five years after mastectomy. The mechanisms underlying these observations are unclear, but there is emerging evidence that Na/K ATPase, which is the principal inhibitory target for these glycosides, could be a therapeutic target for cancer treatment. The relationship between altered metabolism during tumorigenesis, Na/K ATPase activity and pathology is not well understood and there are currently no non-invasive clinically validated imaging tools of Na/K ATPase activity in cancer or the heart. Furthermore despite significant advances in our understanding, the mechanisms underlying the Warburg effect remain poorly understood and imaging techniques still largely rely on 18FDG PET which reports on glucose transport and not downstream bioenergetics. In this CDT project we propose to develop a combination of in vivo imaging techniques employing 23Na MRI for probing intracellular and extracellular sodium ion concentration in combination with 82Rb PET for probing Na/K ATPase activity in tumours and in the heart to offer a hitherto unexplored window on dysregulated metabolism in vivo.